G Kilford and Co antique furniture restoration business, founded in the 1980s, which remains as busy as ever restoring cherished pieces to British Antique Dealers’ Association (BADA) standards of workmanship. We specialise in sourcing, restoring and supplying antique French farmhouse tables, but we also stock a complementary range of antique dining and side tables, dressers and sideboards, together with a wide variety of dining chairs to suit. Today, the two entities sit side-by-side at our extensive, parking friendly premises at Wisborough Green, between Billingshurst and Petworth in West Sussex. Every piece of furniture we source is unique and totally antique. Often these tables have a fascinating back history. Antique French farmhouse tables, typically dating back to the first half of the 19th century, would have played an integral part in French family life at the time. Many of those that we come across, however, have been sadly neglected, left behind in an abandoned property or just stored away. Until now! We use the resources of a talented team of antique experts, covering the continent of Europe and beyond to source these long lost treasures. With loving care and great attention to detail, our passion is bringing these proud, characterful tables back to authentic life, before finding them a new home – a place where they can offer focus and practicality. In a private residence, a hotel, a restaurant, an independent school even - where catering and entertainment is a priority. To see if the table fits well into your home we can deliver the table to you so you can try it before you buy it. Available locally and in the London area. If you decide to buy table then there will be no delivery charge but if you decide not to have table then you pay delivery charge - the price will always be agreed beforehand. We carry a large and interesting stock of good quality 17th, 18th and 19th century furniture for sale in our showroom located next to the original workshop here in west Sussex. 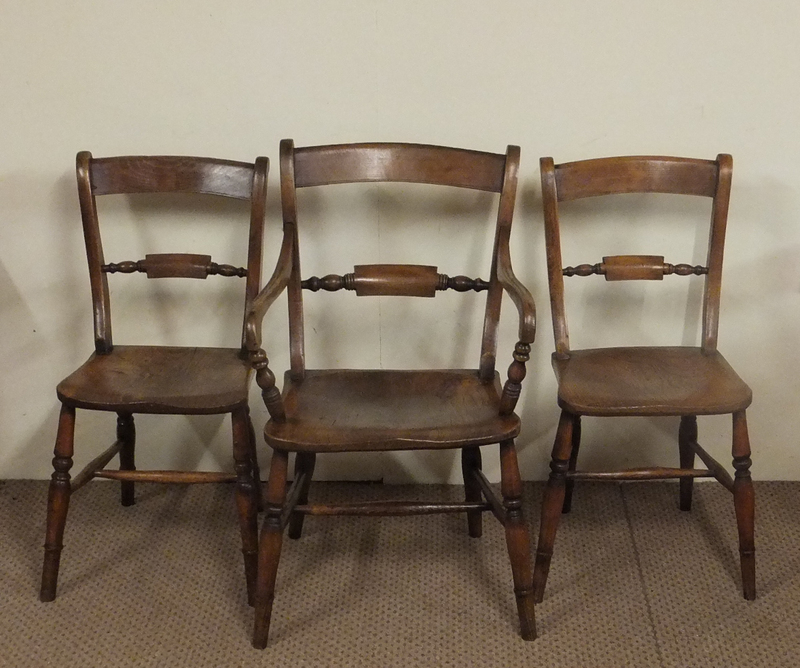 We specialise in country antique furniture of the early periods in oak, walnut, elm, ash, cherry and fruitwood and also deal in interesting pieces of mahogany and painted decorative pieces. 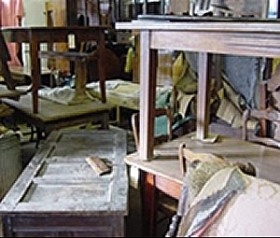 Antiques often include antique cupboards, sideboard, side table and dining chairs. We at G R Kilford & Co. have been established for over 30 years restoring to BADA standards. Our highly trained team of professional craftsmen has a wide range of restoration experience from museum pieces to international furniture dealers and, of course, your valued private collections. Our antique restoration service deals with antique furniture restoration, veneer repair, wood turning, carving, replacement part service, lock repair and all general repairs. We also provide marquetry repair, French polishing/colour matching and repatination of furniture. All work carried out by trained craftsman specializing in Antique Furniture, to a very high standard. Visa, MasterCard, Bank Transfers, British Sterling cheque or US Dollar cheque. Interest free credit at 0% APR available on selected items subject to status. The items shall remain the property of the Works Antique Furniture until full payment is received. All contracts entered into through this web site are subject to the English jurisdiction of English law. 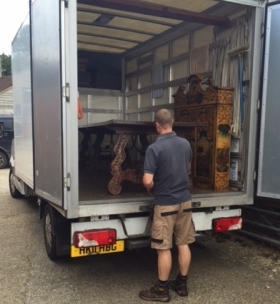 Transport and insurance of your valued antiques from our shop here in West Sussex can be arranged by us for any piece, regardless of its size, to anywhere in the world. We have several shippers that we frequently use and trust. We operate a professional Antiques Finders Service. If you cannot see what you require on our site we may well have it in stock and not yet listed on this site yet. The fascination is in knowing every piece we source is a complete one off, a product of 19th century individual detailing and craftsmanship. Created in styles, shapes and sizes ranging from the conventional to the quirky – featuring an array of wood finishes - oak, cherry, elm, ash, chestnut and all fruitwoods. Sometimes we find farmhouse tables which are in remarkably good condition, needing little more than a little light reviving for the original finish. Others may be in a rather sorry state, requiring careful and detailed restoration, but always taking care to preserve the original patination which has evolved over time. Today, our national and international clients - homeowners, interior designers, restaurateurs, hoteliers, collectors and more besides - travel far and wide to visit our spacious showrooms or liaise with us from distance. We make life easy for all our customers, delivering to your door - across the UK, throughout Europe and across the United States, typically using our proven antique shipping service. From the Cotswolds to California, from the Home Counties to the hinterlands of Italy and beyond - our furniture embellishes a myriad of locations. We have a loyal and knowledgeable staff who take huge pride in their work. From our discerning suppliers to our highly skilled team of restorers and sales advisors, they are all dedicated to the task of giving a new lease of life to each individual item, ahead of delivery to your property.